1. The Joy of Sake, tasting of 140 varieties of sake ("the largest sake tasting event held outside Japan"), Thursday, September 30, 6:00 p.m. to 9:00 p.m., at The Puck Building, 275 Lafayette Street. $75/person (212.799.7243 or 888.799.7242). 2. Grand Central Oyster Frenzy, unlimited oysters, Friday, October 1, and Saturday, October 2, 6:00 to 8:00 p.m., at the Grand Central Oyster Bar at Grand Central Terminal. $75/person (212.490.6650). 3. A Taste of Chinatown, outdoor food festival featuring food samplings for $1 per plate, Saturday, October 2, 1:00 to 6:00 p.m., Bayard Street, Mulberry Street and Elizabeth Street (map). 4. Second Annual Oyster Festival, downtown outdoor oyster festival inspired by the Galway International Oyster Festival in Ireland, presented by Ulysses, Saturday, October 2, beginning at noon, at Hanover Square and Stone Street. 5. Chile Pepper Fiesta, Saturday, October 2, and Sunday, October 3, 12:00 to 5:30 p.m., at the Brooklyn Botanic Garden, 1000 Washington Avenue. Free with Garden admission (718.623.7200). 6. Garden State Wine Growers' Grand Harvest Festival, featuring 150 wines from New Jersey vineyards, Saturday, October 2, and Sunday, October 3, noon to 5:00 p.m., at Alba Vineyard, Finesville, New Jersey. $16/person (advance purchase). 7. Fourth Annual International Pickle Day, featuring pickles from around the world, Sunday, October 3, 11:00 a.m. to 4:30 p.m., at Orchard Street (between Grand and Broome). Free (212-966-0191). 8. Eating & Drinking, A Tasting Celebration, sample food from more than 35 restaurants at Time Out New York's annual restaurant tasting event, Monday, October 4, 6:30 p.m. to 9:30 p.m., at Splashlight Studios, 529 West 35th Street (between Tenth and Eleventh Avenues). $75/person (646.432.3012). 9. The Italian Home Cook, discussion with Marcella Hazan, Arthur Schwartz, and Michele Scicolone, moderated by WNYC's Leonard Lopate, Tuesday, October 5, at the Caspary Auditorium, Rockefeller University, 66th Street and York Avenue. $25/person (212.415.5500). » From the Montreal suburbs comes Banlieusardises, Martine's French language site on food and other diversions (there's also an English language counterpart, Suburblicious). » While not strictly a food blog, per se, blork blog frequently turns its attention to matters of cooking and dining in Montreal. » The official site for Montreal's public markets provides detailed information on Atwater Market and Jean Talon Market. » Montreal Food publishes restaurant reviews and other insights into Montreal's food scene. » Les meilleurs cafés à Montréal offers a short round up of the best cafés in the city. » montrealplus.ca offers Montreal restaurant reviews as well as additional pages with travel-related information. » fodors.com provides a handy guide to Montreal's restaurants. Wherever we went to out to eat in Montreal, we found that the domestic beer landscape was divided between la blonde and la rousse. We kept going back for la rousse -- slightly nutty, deep reddish brown beer with the subtle flavor of caramel. I love dark beers, but these were different. 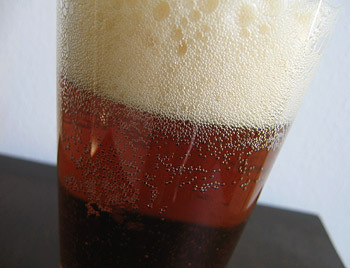 Not too bitter or malty, Canadian red beer is robust and full-flavored, yet as thirst-quenching as a lighter beer. My favorite was probably Le Cheval Blanc Rousse, which I had on draught at Bières et Compagnie, but other red beers we came across include Griffon Rousse, Belle Gueule Rousse, Boréale Rousse, and Rickard's Red. On our last day, we stopped at the Super C across from Atwater Market and grabbed a couple of cases as a liquid souvenir of our trip. I am sad to say that like the fresh bagels and baluchons we took home with us, those bottles are just a memory now. I was surprised to discover that today's Los Angeles Times features an article on the world of food blogs, including yours truly. The article, "Hot links to some edgy bloggers," throws a few jabs at the food blogosphere, but The Food Section seems to have emerged unscathed. Phew! Eating & Drinking, A Tasting Celebration, sample food from more than 35 restaurants at Time Out New York's annual restaurant tasting event, Monday, October 4, 6:30 p.m. to 9:30 p.m., at Splashlight Studios, 529 West 35th Street (between Tenth and Eleventh Avenues). $75/person (646.432.3012). 1. Sagra di Maiale, an outdoor pig festival featuring heritage pork from North Carolina and the first New York State apples, Wednesday, September 22, 1:00 to 7:00 p.m., at Il Buco, 47 Bond Street. $7/tasting (212.533.1932). 2. Harvest in the Square, food and wine tasting event in Union Square Park, benefiting the Union Square Partnership, Thursday, September 23, 7:30 to 9:30 p.m., at Union Square Park. $85/advance, $95/at the door (212.239.6200). 3. P.J. Clarke's 120th Birthday Celebration, "America’s quintessential saloon" celebrates its 120th year with 120 cent hamburgers, Sunday, September 26, 11:30 a.m. to 3:00 a.m., at P.J. Clarke's, 915 Third Avenue (212.317.1616). 4. Oustanding in the Field, dinner at Quail Hill Farm in Amagansett, Long Island, with menu by guest chef Seth Caswell of Nick & Toni's, Sunday, September 26, 3:00 to 7:30 p.m. $130/person (1.877.886.7409). 5. Secret Tomato Lovers Society Dinner, reception and dinner featuring a tasting of heirloom tomatoes, presented by the American Institute of Wine and Food, Monday, September 27, 6:30 p.m. to 9:00 p.m. at Village, 62 West Ninth Street. $65/members, $70/non-members (718.229.6565). 6. From Hokkaido to Kyushu: Regionality in the Sake World, lecture and tasting led by sake expert John Gauntner, Tuesday, September 28, 6:30 p.m., at The Japan Society, 333 East 47th Street. Tickets: $25; Japan Society members & seniors $20. Attendance is limited, and advanced reservation is required (212.752.3015). 1. Have You Eaten Yet? : The Chinese Restaurant in America, an exhibit exploring the Chinese restaurant’s origin and growth in America and its cultural significance, at the Museum of Chinese in the Americas (70 Mulberry Street, 2nd Floor). The exhibit continues through June 2005. Suggested admission is $3 (212.619.4785). The international cooking event Is My Blog Burning? (IMBB) rolls on. As announced by Donna Marie Zotter of There's a Chef in My Kitchen, the theme for the eighth installment of IMBB is "Lift your Spirits High!" Earlier editions of IMBB have focused on soup, tartines, cake, rice, fish, grilling, and dumplings. The current installment of IMBB calls for recipes that involve wine or spirits as ingredients. Broadly defined, this includes everything from entrees to cocktails. As we enter the fall season (way too soon for my liking), I decided to make a drink for IMBB that would be an ode to the end of summer. A few months ago, I bought Cesar: Recipes from a Tapas Bar, a book of cocktail and tapas recipes from Cesar in Berkeley, California. Though I've never been to Cesar, I've heard great things about the restaurant, and I decided to make its house tequila drink -- the Three-Citrus Margarita. Although there are many variations on the Margarita, the cocktail typically includes tequila, cointreau, and lime. Once these ingredients are included, the possibilities for further extrapolation are endless. The Cesar version includes fresh-squeezed orange, lemon, and lime juice, tequila, and a dash of creme de cassis, a sweet, black currant-flavored liqueur. A fabulous hostess and Dallas socialite, Margarita Sames, hosted a pool side Christmas party at her vacation home in Acapulco, Mexico. The party game of choice for Margarita was to get behind the bar and see what concoctions she could develop and let her party guests test and rate the results. That evening she mixed three parts tequila with one part Cointreau and one part lime. The result was a success among her guests and quickly traveled through the elite in Texas and soon Hollywood under the name of the one who created it. I made the drink twice. 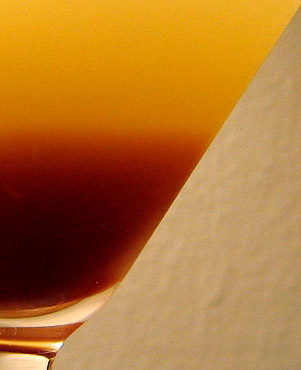 The first time, I followed the recipe explicitly, combining the three juices with tequila and ice in a cocktail shaker, shaking the mixture until icy cold, and straining it into a martini glass along with a dash of Creme de Cassis at the end. It was thirst-quenching, but something felt missing, so I decided to add some cointreau in my second attempt, which gave the drink that certain margarita flavor I was looking for. When you add the Creme de Cassis, it falls to the bottom of the glass, giving the cocktail not only a hidden burst of sweetness, but a striking layered effect -- beautiful and refreshing. The French influence on Montreal is palpable, but that doesn’t mean it’s monolithic. Montreal is, in fact, a diverse, multiethnic city, and I was surprised to learn that Italian-Canadians, who immigrated during two waves at the end of the 19th Century and after World War II, are considered its largest ethnic group. 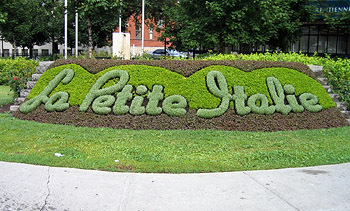 The cultural and commercial center of the Italian community is located in Montreal’s Little Italy, or La Petite Italie, as it is more properly known. 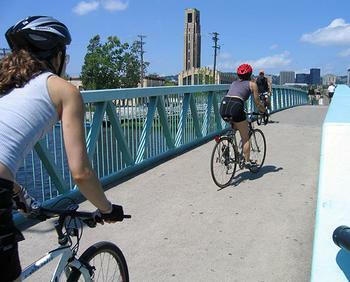 Located northeast of the city’s center, the district’s main drag is St. Laurent Boulevard, which is lined with Italian groceries, cafes, restaurants, and gelateria. While walking St. Laurent Boulevard, the cultural contrast is striking -- while all of the signage is in French, the red, green, and white colors of the Italian flag are everywhere. Sagra di Maiale, an outdoor pig festival featuring heritage pork from North Carolina and the first New York State apples, Wednesday, September 22, 1:00 to 7:00 p.m., at Il Buco, 47 Bond Street. $7/tasting (212.533.1932). 1. Have You Eaten Yet? : The Chinese Restaurant in America, an exhibit exploring the Chinese restaurant’s origin and growth in America and its cultural significance, opens this week at the Museum of Chinese in the Americas (70 Mulberry Street, 2nd Floor) and continues through June 2005. Suggested admission is $3 (212.619.4785). 2. Potato Festival, featuring potato peeling and mashed potato eating contests, Saturday September 18, and Sunday, September 19, 11:00 a.m. to 7:00 p.m., at Heaven Hill Farm, 451 Rt. 94, Vernon, New Jersey. $7/adults, $5.00/children under 12 (973.764.5144). 3. New Hampshire: A Study in Agricultural and Culinary Innovation, lecture by writer Helen Brody presented by the Culinary Historians of New York, Monday, September 20, 6:30 p.m. reception/7:00 p.m. program, at The Culinary Loft, 515 Broadway, Suite 5A. Members/$25, Guests/$30 (212.334.4175). 4. Sixth Annual Artisanal Sake Dinner, featuring a nine-course menu paired with rare, artisanal sake, Monday, September 20, and Tuesday, September 21, at Chanterelle, 2 Harrison Street. $275/person, tax and gratuity included (212.966.6960). 1. Cookin': A Sizzling Entertainment, "a fast-paced kitchen percussion show combining comedy, rhythm, and non-verbal performance," at the Minetta Lane Theatre, 18 Minetta Lane (212.420.8000). Although a case could be made that one could exist solely upon the edible bounty of Montreal's public markets, the city also has its fair share of wonderful specialty food shops, a number of which maintain a singular culinary focus -- be it olive oil, tomatoes, or even salmon. All of the stores listed below are conveniently located in the Plateau district, though the bakery Première Moisson has branches throughout the city. A word of advice: beware exploring these shops on Mondays, when many are closed for business. A quick call in advance to check store hours will be worth your time. We stayed in Vieux Montreal (old Montreal), the city’s historic core. Dating from Montreal’s founding as a French settlement in the 17th century, old Montreal has been lovingly preserved and restored since the 1960s after years of neglect. Today, the area is a major tourist destination, though a beautiful one (it beats Times Square any day). Its narrow, cobblestone streets are lined with formidable 18th and 19th century buildings, a number of which have been converted into boutique hotels. Hotel Nelligan, Hotel Place d’Armes, and the St. Paul Hotel (where we stayed) retain their period façades, though their interiors have been largely overhauled with cool modernist design.